Calls Moving to Consults is a thought leadership video in the “10 Inevitable Changes in Pharma 2015” series that was hosted by the stellar Richie Etwaru, Chief Digital Officer with Cegedim. This video addresses the question: How can the pharmaceutical industry reskill representatives to be knowledgeable consultants to physicians? Today, sales expertise is not enough. The pharmaceutical representative needs to be a broker of information. Physicians now have very limited time – and dictate when they can meet with representatives, from whom they need comprehensive information that they can pass along to their increasingly educated patients. In this video, Jo Ann Saitta, Chief Digital Officer of the CDM Group, Stephan Klaschka, Innovation and Healthcare Consultant, and moderator, Richie Etwaru, Chief Digital Officer at Cegedim, examine this shift and the challenges pharmaceutical companies may face in properly retraining their people. These challenges include: adopting a culture of learning agility; integrating silos of information; having the ability to serve up dynamic content; and training representatives to utilize technologies that will maximize their brief but demanding visits with physicians. Use this link to watch all 10 videos in the series on YouTube directly – enjoy! ‘School for Intrapreneurs” finalist in eyeforpharma awards 2015! We are honored by eyeforpharma’s announcement for Boehringer Ingelheim “School for Intrapreneurs” to be a Finalist for yet another award: the prestigious eyeforpharma Philadelphia awards 2015 in the Most Impactful Emerging or Global Initiative category! The eyeforpharma Philadelphia Awards recognize those in the pharmaceutical industry who are driving pharma forwards not just with higher short-term profits, but with better customer innovation, value and outcomes leading to longer-term success. eyeforpharma’s mission is to make the pharmaceutical industry more open and valued, which means these awards are a literal translation of why we exist. It is our responsibility to shine a light on where pharma does well, to inspire others into similar or better action. Author Stephan KlaschkaPosted on January 21, 2015 February 13, 2015 Categories Award, Entrepreneurship, Event, Healthcare & Life Sciences, Innovation, Intrapreneurship, Leadership, Management, Metrics, Project Management, ResistanceTags disruptive innovation, entrepreneur, entrepreneurship, innovation, intrapreneur, intrapreneurship, measurement, organizational effectiveness, projects, Resistance, strategic innovation, uncertainty, value propositionLeave a comment on ‘School for Intrapreneurs” finalist in eyeforpharma awards 2015! 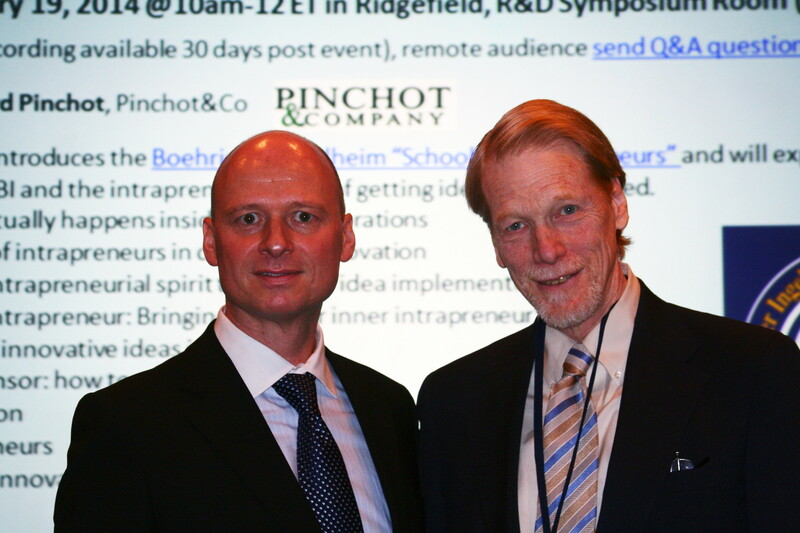 We are honored that the Boehringer Ingelheim “School for Intrapreneurs” got nominated for Market Gravity announce the fifth annual Corporate Entrepreneur Awards in New York. Why successful innovations get shut down. WhIle we expect unsuccessful initiatives and projects to get shut down, what sense does it make to stop hugely successful ones? It doesn’t make sense to shut down profitable programs – or does it? It happens all the time when the current yet wilting business model still tastes sweet. Investing in building a disruptive, future business model appears less palatable as it takes uncomfortable transformation that comes with investment cost and lower profits initially. The sobering reality is that short-term gains often win over long-term investments, sustainability and bold moves to explore uncertainty and white space. Here is a quick example from the fossil oil and gas industry straight out of Bloomberg Businessweek, “Chevron Dims the Lights on Green Power” (June 2-8, 2014): Chevrons renewable power group successfully launched several projects generating solar and geothermal power for over 65,000 homes. Despite margins of 15-20%, the group was surprisingly dissolved earlier this year after they had just about doubled their projected profits from $15 million to $27 million in 2013, the first year of their full operation. – Why would you kill a profitable new business? As for reasons for the shut-down, a former Chevron employee and Director of Renewable Energy notes that Chevron’s core businesses, oil and gas, still remain more profitable than renewable energy. This development signals that Chevron’s leadership is willing to experiment with renewable energy but does not seem fully committed – it makes Chevron’s slogan “Finding newer, cleaner ways to power the world” sound like lip-service. Instead, Chevron continues to hold on tightly to their old business model to squeeze out the last drop of oil. Chasing short-term profit margins may prove not only a questionable path for long-term company sustainability but also from a business model perspective. While oil and gas prices have been on the rise for the past decades, it is well-known that these natural resources become scarce, so extraction from more challenging locations becomes increasingly expensive. It cuts into the company’s profits and the consumers’ pockets. To date, Chevron already pays a higher cost for extracting oil compared to competitors. The risk here is to lose out on developing and acquiring new technologies that will be the make-or-break competitive advantage in the industry’s future. Interestingly, Chevron’s competitor and largest oil company, Exxon-Mobil, takes a different approach. Even after initial setbacks where proof-of-concept did not scale to industrial size, Exxon-Mobile now partnered with Craig Venter’s Synthetic Genomics to produce oil from micro-algae at industrial scale. Hopes are high that this bio-tech and bio-agriculture approach proves more practical, profitable and sustainable to replace fossil fuels in the future. Sounds risky? It sure is, but with profits from oil and gas still in the tens of billions this is the time to invest heavily in the jump on to the next technological S-curve. You may recall Craig Venter as a most successful entrepreneur and also the first to sequence the human genome, so there is no shortage of top bio-brainpower, which opens the flow also for more investment capital. Truth being told, several other bio-fuel ventures of this nature exist all around the world. Neither made it to produce in industrial scale needed to satisfy the world demand for crude oil – yet. There is no question, however, that the world is running out of affordable oil and gas at accelerating speed. Disruptive technologies will emerge to fill the gap and redefine the energy sector. The learning here is that even profitable disruptive ventures get shut down at times when the leadership is comfortable and holds on tightly to the existing business model they are familiar with and doing what they always did rather than taking transformative steps to prepare the organization for the future. Even with the writing clearly on the wall, the way of how profitability of a new venture is measured and the (still higher) margins of the established business (fossil fuels) make short-term focus attractive despite concerns over business model sustainability. So often enough there is little patience to further develop even successful, transformative ventures of tomorrow in favor of enjoying the sweet but wilting fruits of today. Somehow this short-term mindset painfully reminds me also of the established car industry who, obviously, had little interest to bring electric vehicles to market at scale over the past decades until a Tesla comes around to show them how it can and should be done. As for our example, time will tell whether Chevron or Exxon-Mobil made the better choice in the long run to win the new business model race leading us into the post-crude oil era – or if they both get disrupted by an even different new technology altogether. The earlier post “How you become the next Steve Jobs!” relies on an innovation ecosystem of sorts that already exists in your organization – but what if there is none? What if you find yourself in a place that struggles with Why mature organizations can’t innovate and Overcoming the Three Big Hurdles to Innovation in Large Organizations? It is not easy and takes time turning an organization’s mindset from what is into what if. It’s a great and rewarding achievement, though, if you can pull it off! So, let’s continue there: If you find yourself in a company which does not provide an environment that supports intrapreneuring, you may need to build an innovation ecosystem within a large organization. Practically, you choose to become a midwife helping ideas of your colleagues getting a chance to come to life. This enables other aspiring intrapreneurs to step up, unite and act together. It’s a bold step and disruptive approach but necessary to induce ability to meaningful and fundamental “10x” change again to an organization (see also 10x vs 10% – Are you still ready for breakthrough innovation?) as part of an ambitious Innovation Strategy: Do you innovate or renovate? A positive attitude that you will need to persist and push on. A very powerful approach and critical puzzle piece in the ecosystem is the School for Intrapreneurs. We achieved to build this school successfully together with help from like-minded and supportive colleagues that I was fortunate to meet along my crooked intrapreneurial career path, if you want to call it that. The underlying premise of the SFI is that innovation skills can be taught, as mentioned in “How you become the next Steve Jobs!” – So, we teach them in this program. Building intrapreneurial skills systematically, however, is only part of the deal. The real value of the program for the participants lays in experiencing the obstacles an intrapreneur faces in an organization themselves: the rocky road of rejection trying to get an idea on its feet. We prepare our fellow employees in a process where they form supportive teams to collaborate in order to develop their ideas together and experiment. This includes ways to communicate with management in constructive and non-threatening ways on How Intrapreneurs avoid “No!”, for example. It culminates in pitching ideas to experts and potential sponsors for funding, implementation and support. Executive sponsorship ensures strategic alignment of ideas with company interests. It also increases the chances dramatically for idea transitions into the established processes of the regular organization, i.e. the idea becoming a project to be implemented. This is why special emphasis needs to be put on preparing management how to support and benefit from intrapreneurs; after all, there are risks involved with intrapreneuring for the individual (see also The Rise of the Intrapreneur). This SFI program design addresses How to grow innovation elephants in large organizations and deliver big results along the lines of 10x vs 10% – Are you still ready for breakthrough innovation?. In fact, the return of the SFI program so far is a 1:10x return-of-investment (ROI), so we are right on 10x. DOORWAY is a two-hour awareness course that outlines how innovation happens in large organizations, what typical obstacles are, what is an intrapreneur and already hints towards what is offered in the succeeding courses, PATHWAY and JOURNEY. PATHWAY is in its core an incubator and accelerator over a 12 weeks with a mix of training and group work. Research suggests that approx. 5% of the workforce have the intrapreneurial spirit, which is consistent with our school’s enrollment numbers. At the end of the course, the teams pitch their developed ideas to a panel of experts and managers representing different business functions for in-depth feedback and advice how to improve the ideas. – Think “Shark Tank” but without bloody teeth. Teams with the most promising ideas then pitch to high level executives for sponsorship and support to turn their idea into an implementation project that enters the regular development processes in the organization. Receiving executive sponsorship is another level of validation that confirms strategy alignment with company interests. JOURNEY is a six-month course designed to accompany the team implementing their ideas by providing a mix of skill-building and team-customized coaching. – Why is this needed and important? Even with executive sponsorship the project has neither been budgeted for nor are other resources planned and available for its implementation; so, the project still disrupts the establishment and may trigger resistance. We also ask JOURNEY participants to connect with the next group going through the PATHWAY course to network, share their experiences and help guiding the “next generation” of graduates. The goal is to achieve sustainability of the program by growing the number of like-minded, experienced and connected employees over time. Over time, an increasing number of graduates keep the perpetual pipeline of fresh ideas open. They also grow to become a powerful, far-reaching and growing network of active change-makers across all parts of the organization as they connect and pass on their knowledge to the next class going through the School for Intrapreneurs. These are the self-identified leaders of change that share a common innovation terminology, skill-set and experience while they help shaping the organizational culture and mindset on the way towards a sustainable environment, an innovation ecosystem. The personal journey and ‘intrapreneurial experience’ is of utmost importance for the School’s participants – a theoretical training alone does not do the trick. It has to be hands-on and all the way to implementation. This is why the participants value the safe space to operate and experiment in. Typically, talent in large organizations is selected top-down by management. In contrast, talent self-identifies bottom-up and based on –intrapreneurial- merits though the School for Intrapreneurs. Alumni are hardened by their experience and become part of a growing community of capable and engaged change agents. Successful pitches to executives validate the alignment with company strategy – not only for the individual idea but also broader for the entire program of the School for Intrapreneurs. The program allows gives more disruptive, risky and outside-the-box ideas a chance that otherwise would not have been brought to executive attention, or so our executive sponsors said. The School for Intrapreneurs is part of a larger framework to change company culture over time by cultivating discovery and 10x innovation capabilities once again. 10x vs 10% – Are you still ready for breakthrough innovation? How you become the next Steve Jobs!